As a professional and powerful tool, Pavtube DVDAid can help users to rip DVD movies for play on any portable media device, application or HD media players. 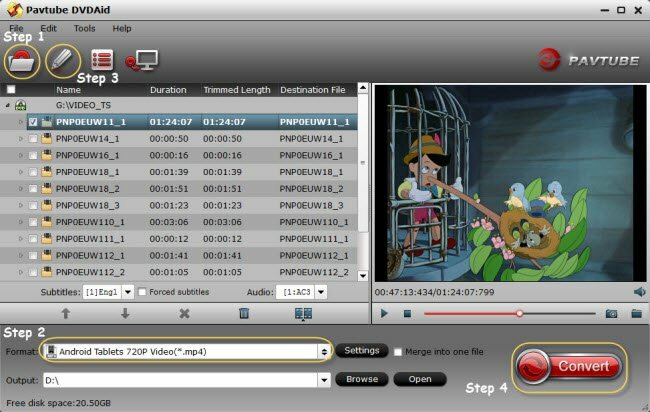 With it, you can rip DVD discs and convert DVD ISO/IFO image files and DVD Folder to AVI, MPEG, MKV, WMV, FlV, MOV, MP4, 3GP, 3GPP, MPG, ASF, VOB, WMA, M4A, MP3, etc. and edit the DVD videos as you like for watching on any popular media players. Insert your DVD disc into your computer’s DVD-Rom, start up DVDAid and click the “Load Disc” icon to begin uploading files. You can also convert DVD without the disc, using ISO files, or DVD Folder. After the DVD files are loaded, you can preview them on the right viewing window and take snapshots of your favorite movie scene. Click “Format” bar and select the format you want from the drop-down list. Just below Format is Output, here you can browse your computer for a better destination folder for DVDAid to output your converted movies. From the Edit menu you can choose six distinct editing workspaces; Trim, Crop, Text Watermark, Image/Video Watermark, Effect, and Audio Replace. Press “Convert” button to rip DVD movies. After conversion, you can transfer the converted files to for personal use. Now that you’ve liberated your DVD movies!